The founder and former creative director of Madhouse Studios, Maruyama has had a hand in the Japanese animation industry for forty years. In the early 1970s, he helped establish the revered animation studio and led the team as a creative producer for many years. Over the next three decades, Maruyama would oversee countless television, OAV, and theatrical releases, developing a reputation for finding and nurturing talented directors. 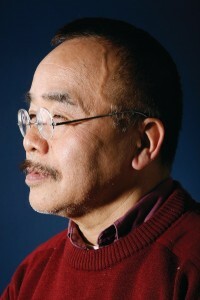 Under his guidance, talents like Satoshi Kon and Atsuko Ishizuka flourished. Maruyama also engaged with overseas partners, working with the Wachowskis on the Animatrix project, and overseeing anime takes on classic American comic book characters. In 2011, Maruyama left Madhouse and formed MAPPA (Maruyama Animation Produce Project Association). MAPPA allows him greater creative freedom to pursue projects that may be less obviously commercial. The studio’s first major project was the critically-acclaimed Kids on the Slope, which reunited most of the creative teams behind Cowboy Bebop and Samurai Champloo. He continues to consult with Madhouse on various projects, such as Hunter x Hunter and the Fighting Spirits: Hajime No Ippo series. Maruyama is currently developing the highly-anticipated TV animation series Rage of Bahamut, as well as director Shinichiro Watanabe’s Terror In Resonance, and the theatrical project At The Corner Of This World, directed by Sunao Katabuchi. Maruyama’s list of credits has produced an amazing library of animation, including Barefoot Gen, Dagger of Kamui, Record of Lodoss War, Vampire Hunter D, Ninja Scroll, Card Captor Sakura, Trigun, Perfect Blue, X, Boogiepop Phantom, Chobits, PitaTen, Abenobashi Maho Shotengai, Gungrave, Gunslinger Girl, Black Lagoon, Kiba, Nana, Tokyo Tribe 2, Beck, Monster, Highlander: Search for Vengeance, Devil May Cry, Death Note, RAINBOW and Red Line. Maruyama has also overseen production of critically acclaimed films such as Paprika, The Girl Who Leapt Through Time, and Summer Wars.